The group Exo has racked up a staggering 18 million views for their latest video. It’s not even a month old! No wonder the group has a rabid fan base. It also has some terrific fan doodles. Twitter user ExoDoodles has been doing regular updates of, well, Exo doodles for the past few months, pleasing fellow Kpop fans and earning over twenty-three thousand followers. On Ask.fm, the mysterious Twitter user said she is based in the U.S. and is seventeen years old. 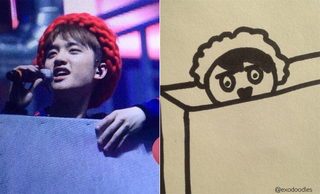 She added that she first did an Exo doodle and thought it was amusing, so kept at it. I agree! Her doodles are fantastic. If you’re into Kpop or just cute, silly drawings, you can follow her on Twiiter right here.